When Vee and I went on holiday to China in September 2000, on the long flight back we talked to a 25 year old Chinese woman sitting next to us who was making her first-ever trip out of China to travel to Oxford University to do a PhD in biochemical engineering. She was called Hua (English name Cathy). Out of that conversation came a friendship between and her husband Zhihao (English name Alex) that has lasted six and a half years now and has become so close that we regard them like a daughter and son. Hi, Joshua, welcome to the world. You have the most wonderful parents and we are so looking foward to being your British ‘grandparents’. Love to all three of you. This entry was posted on Wednesday, April 25th, 2007 at 8:54 pm and is filed under Miscellaneous. You can follow any responses to this entry through the RSS 2.0 feed. Responses are currently closed, but you can trackback from your own site. Hua is my best cousin and friend. I am so happy for her that a newborn is coming to the family. Joshua is such a pretty adorable baby. I really hope that I can hold him in my arm now. Best wishes to all of you. Warmest welcome to Joshua and Congratulations to Hua and Zhihao! Most Chinese parents give their children names for reasons. 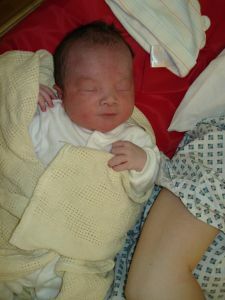 I was told that, Joshua’s name reflects the ‘combi’ of the new parents: its pronunciation is similar to ‘Zhihao-hua’ – such a linguistic coincidence and clever thought! Best wishes for all three of you! Love from Ting and Dongsheng. Yah! Sooooooo glad that I have such an absolutely adorable nephew!!! Best wishes to him, Cathy and Alex. Congratulation to you, Alex and your family. Joshua looks very healthy and he looks like you. Any more photo? I am looking forward to seeing more photo. He looks gorgeous and must be an attractive boy. They both look very well, well done Yehua and Little cute. Thanks for your email with lovely photos. You all will have a totally difference life, enjoy it. Make sure send us more photos to show his growing, that will be very interesting. We might go to London next month for our Visa, if we do, we can pop down to see you. Long time no see, do miss all of you. Also say hello to Yehua’s mum, she is great grandma now!! Hi, thanks for all of these, Roger and all the visitors. To be a father is something that I am not completely familar with yet. I then need to learn a lot. In my mind, it means happiness and hard work, it means greater responsibility and lots of burden. So, I will try my best. But, to us, the idea originally comes the film, “Life is Beautiful”. If you haven’t watched it, highly recomended, esp. if you have some children. It shows how much a parent could love the child and what love is actually meaning. Then, we start to love the name of Joshua since we want to love our child/children indefinitely. Also, since the last three characters of this name is my wife’s first name as well, and the first three characters sound a little bit like my first name. Then, there it is. We will try our best to bring him up as we want and to make himself a happy man and to make him a useful person to the WORLD. ps: Joshua and Hua are home from 2 hours ago. hi Joshua is lovely boy. do not study law, to study medicine because there are less boy medical students. son in mid August. Your son will be my son’s big brother although he is still young.